BANGKOK • Thailand's military court delivered its harshest sentence for insulting the monarchy, jailing a man for 35 years yesterday. 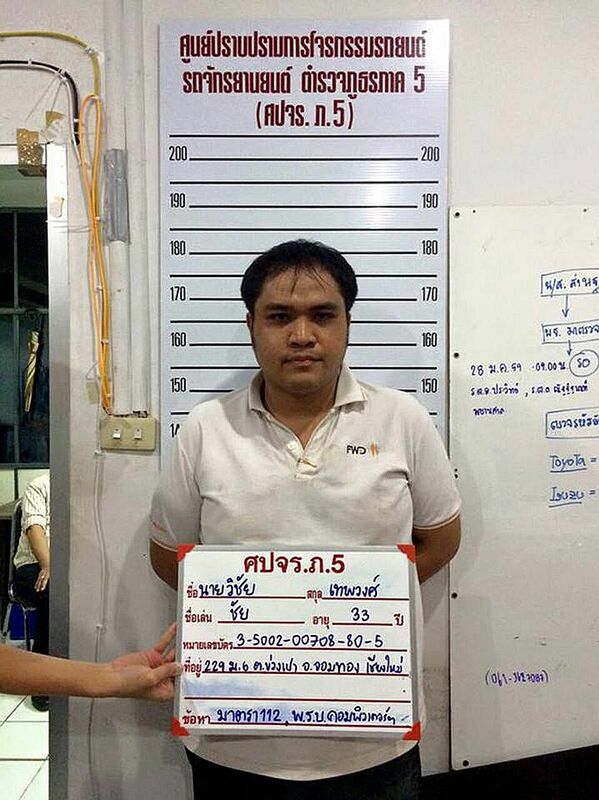 Vichai Thepwong, 34, a former insurance salesman, was initially sentenced to 70 years, but the jail term was halved after he pleaded guilty to 10 separate violations of Thailand's strict lese majeste law. Vichai was arrested in the northern Thai city of Chiang Mai in 2015 for allegedly posting 10 messages and images on Facebook deemed insulting to the monarchy. Thailand's military government has brought cases against 73 people under the royal defamation law since coming into power three years ago, according to iLaw, a Thai legal monitoring group. Lese majeste suspects are rarely acquitted or granted bail and court cases are routinely shrouded in secrecy, with the media forced to heavily self-censor the details to avoid breaching the broadly interpreted law. The latest conviction carried the heaviest sentence yet, beating a 30-year sentence handed down in 2015. The United Nation's human rights office said it was "appalled" by the sentencing and decried the increasing number of lese majeste cases under junta rule. Yesterday, another Thai man was sentenced to five years' jail for uploading an audio file regarded as insulting to the monarchy. His sentence was also halved after he pleaded guilty. Thai regulators on Wednesday also announced plans to impose financial penalties on Facebook and other companies with video-sharing platforms if they fail to swiftly remove what the regulators deem to be illegal content. The new framework would give the authorities the power to immediately demand the removal of offensive material without waiting for a court order. Thailand's National Broadcasting and Telecommunications Commission gave Facebook a deadline - May 16 - to remove posts and links to Web pages deemed illegal. When the date arrived, the regulator said it would seek court orders and that the company was cooperating with officials. Facebook, which has 47 million users in Thailand, said it had previously restricted access to content alleged to have violated lese majeste laws. Thailand has some of the world's toughest lese majeste laws, which can lead to jail sentences of 15 years for defaming, insulting or threatening members of the royal family. An amended Computer Crime Act, which took effect last month, bars content that is fake or contrary to public order or morality. The number of royal defamation cases has increased following the death of King Bhumibol Adulyadej last October after seven decades on the throne. The revered monarch was succeeded by his son, King Maha Vajiralongkorn.